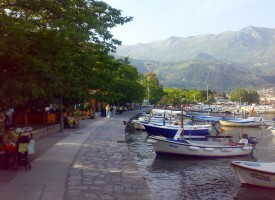 Budva carries the title of the Queen of Montenegrin tourism. With its natural beauty, a rich selection of hotels and private accommodation, seething nightlife during the summer season and peace out of the season, Budva deserves that title. It really is “Wild beauty”. 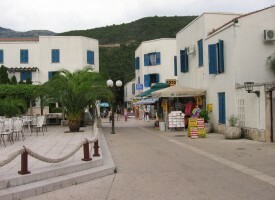 In recent years Budva has been the most popular tourist destination in Montenegro. 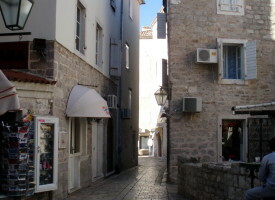 Budva is famous for its old town. Stone houses and churches, narrow streets and small gardens called “Giardini” (giardino – ita. gardens) surrounded by walls on all sides make Budva typical medieval coastal castle. Walking through its streets you’ll find restaurants with a variety of national and international specialties, souvenir shops, exclusive boutiques, perfumeries, jewelers… in short, there’s something for everyone. Opposite the town of Budva lies Sveti Nikola Island, the largest on the Montenegrin coast. The island of Sveti Nikola can be reached by taxi boat or swimming, if you are adventurous. On the island’s beaches, you will enjoy the scent of the Mediterranean blue sea and warm rays of the sun, and there is a restaurant that offers fresh seafood specialties. 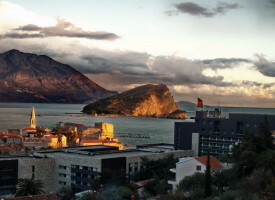 Budva has established numerous cultural events: music, film, literature and children’s festivals, masquerade, fishing festivals, parties on the beach, theater performances, concerts, exhibitions… The two most famous festivals are the theater “City Theatre Budva” (from mid-June to late September) and music festival “Sun Dance” at Jaz beach. 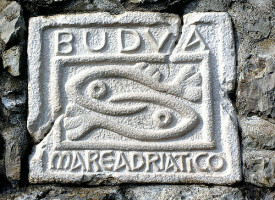 The symbol of Budva consists of two stylized fish facing each other. Why? Here’s a little history… According to legend, Budva was founded by Cadmus, son of the Phoenician king. He was exiled from Thebes, and with his wife Harmonia he came in an ox-wagon to a place of today’s Budva. The city got its name from the Greek word “Bous” (bous – Gr. Ox). Cadmus was cursed to turn into a dragon, so he and his wife jumped into the Adriatic sea to die. But, instead they turned into two fish, which are today the symbol of this city. Village Reževići, where restaurant Giradino is, belongs to the Municipality of Budva, and is located ten kilometers from Budva, i.e. ten minutes easy drive.